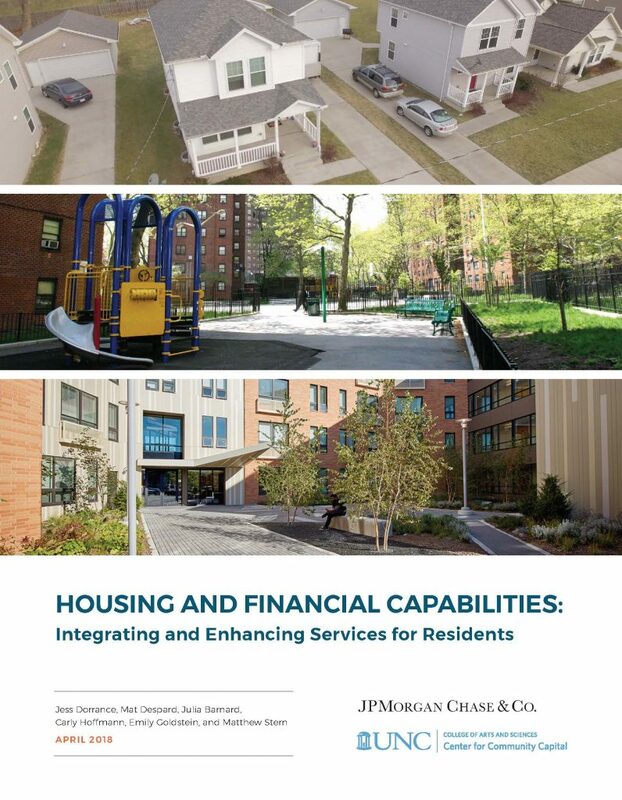 This report identifies effective practices, locates shared challenges, and isolates key considerations for organizations seeking to engage in the work of integrating financial capability services into their existing housing work. Many housing providers are expanding beyond their traditional roles in order to improve the financial stability of their residents. Aside from being simply managers of housing, some are integrating a range of additional services into their work. Existing research makes the case for integrating services into housing programs. Services include general case management, healthcare, daycare, educational opportunities, job training, and financial capability services. The goal of these efforts is to serve the multiple, and often complex, needs of residents and, over the last several decades, housing providers of all sizes, serving diverse populations, have continued to iterate, adapt, and experiment with this type of service integration. This work is difficult, and the housing organizations that choose to take it on are committed and thoughtful. It is important to share successes and challenges but, too frequently, innovations are occurring with limited opportunities to fully measure outcomes and share the insights that can inform the financial capability field and enhance future program development. The Center for Community Capital at the University of North Carolina at Chapel Hill has worked with three housing providers to develop case studies that can elevate their insights. These partners, engaging in innovative efforts to integrate financial counseling and coaching services for their residents, include CHN Housing Partners in Cleveland, Ohio; The Resurrection Project in Chicago, Illinois; and a collaborative effort in New York City with the Department of Consumer Affairs Office of Financial Empowerment, the New York City Housing Authority, and Urban Upbound. Each case study contributes new and important information to practitioners engaged in financial service integration. 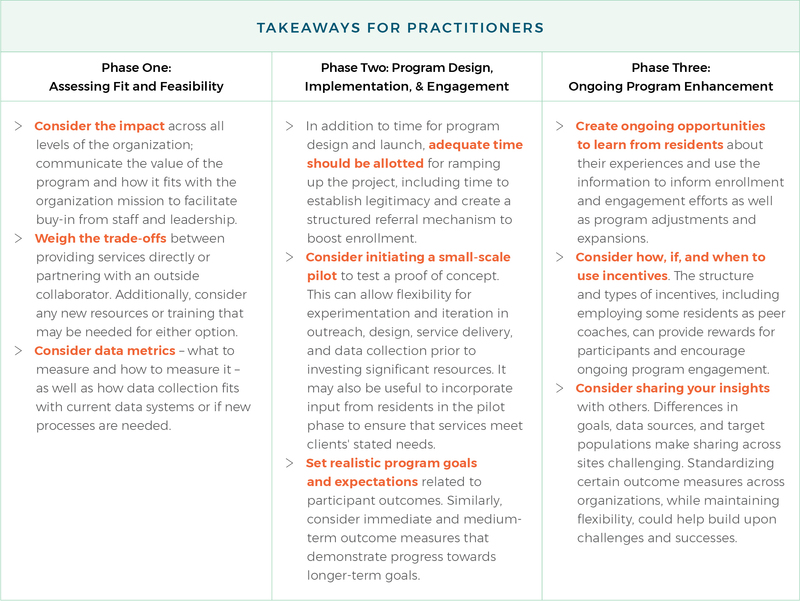 In the Cleveland case, the analysis focuses on outcomes, providing useful information about successes and challenges in moving clients towards goal achievement. In the New York City case, the available data focuses more on client goal-setting, behavior change, and nudges from coaches. This analysis provides useful information about how client commitments become concrete actions and the ways in which interactions with coaches can facilitate client success. Lastly, the Chicago case study illuminates an organization engaging in thoughtful reflection and provides helpful information about how financial services integration can be improved with a focus on communicating the value of financial coaching to residents and building trust among clients. After considering each case study in turn, this report identifies effective practices, locates shared challenges, and isolates key considerations for organizations seeking to engage in this work. Working with motivated project partners at separate phases of integration provides a useful vantage point for assessing lessons that may be most relevant at particular points in time. The table below offers key takeaways for other practitioners by phase of integration. To access an Executive Summary of this report, click here.